It was summer camp, but it sounded serious. Quaker Work Camp was a whole month of work and study. The camp sounded serious, but the campers made it fun. Twenty campers went to each camp. They were mostly high school students and college students. They went to a place that needed their help. Lots of places needed help, and Quaker Work Camps were held in lots of places. Each camper picked one place to go each summer. All month long, the campers worked on one big project together. They helped build a playground in Flint, Michigan. They helped build a water system in Rochdale, Mississippi. They helped build a community center in Delano, California. The local people who lived in those places were in charge of the work. The campers helped, learned, made friends, and had fun. Building things together is a good way to make friends. It is a good way to learn about other people’s lives. The campers worked together with local people. Usually, the local people knew how to do the work better than the campers did. But the campers usually had more schooling. So the two groups seemed a little strange to each other at first. Working together helped make that strangeness go away. The campers woke up every morning at 5:30 for breakfast and worship. They worked hard from 7:00 in the morning until 3:30 in the afternoon – with a break for lunch. From 3:30 in the afternoon until about 9:00 at night, lots of different activities kept the campers busy. They went on field trips and listened to talks by local people. They held business meetings and did chores. They played games and went to dances. The campers always lived in simple buildings. Camp was always held in a place that was poor. The campers lived like the local people did. Living that way helped them understand the problems in the local area. It helped them learn about ways that governments and businesses can be unfair. It helped them imagine new ways that things could be better. These Quaker Work Camps ended a long time ago, in the late 1960s. But they still make a difference today. Every summer for thirty years, the camps changed people’s lives. The camps helped people see new ways to bring peace and justice into the world. 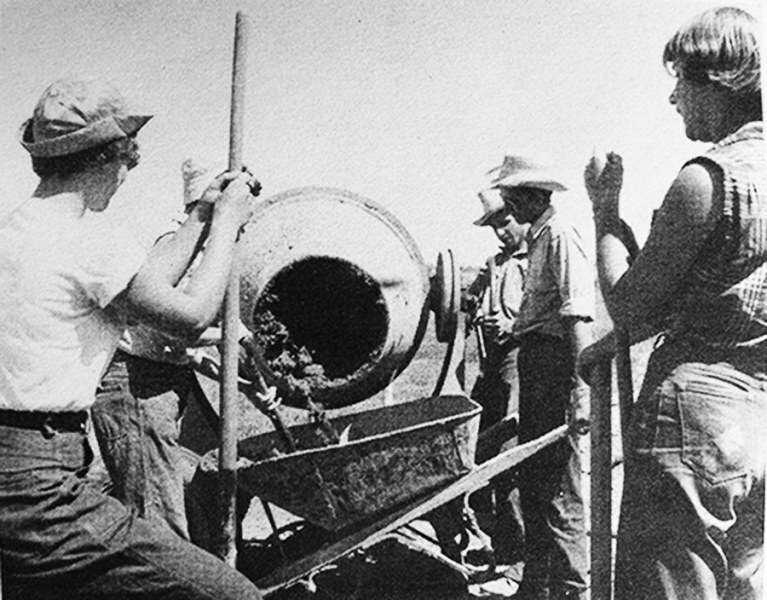 At the end of each summer, campers and local people went back to their regular lives. Then in their regular lives, they kept working hard to make the world better. What is the biggest thing you ever helped to build? How can people decide what to do when they have different ideas about how to build something? If you could build anything in the world, what would it be? American Friends Service Committee (AFSC) conducted the camps described above. For more information, see pages 81-83 of A Western Quaker Reader, published by Friends Bulletin Corporation (2000). Also see Madeline Shaefer’s article, “Lessons of Spiritual Strength: The Legacy of Quaker Work Camps” posted on the AFSC website, January 24, 2013: afsc.org/friends/lessons-spiritual-strength-legacy-quaker-work-camps. To learn about opportunities today to join Quaker service-learning projects, see: Quaker Voluntary Service at quakervoluntaryservice.org, William Penn House at williampennhouse.org/workcamps, and Quaker Work Camps International at quaker.org/qwi.